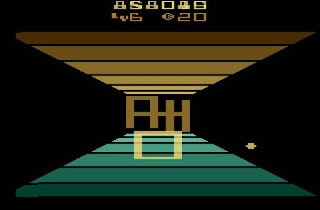 Wall Ball is a 3D clone of Breakout (1976, Arcades) that's exclusive to the Atari 2600. Controlling a racket at one end of a rectangular room, your objective is to continually hit a ball to break 57 of the 72 bricks at the other end. The ball's direction of travel is dictated by where it hits the racket, but you can also hold the fire button to perform a straight shot. Each match consists of five sets (broken down again into four games) and if the ball lands behind you you'll lose one of your lives (ranging from 10-99 depending on the starting level). Upon starting a match, the most obvious problem is the lack of a floor shadow to indicate how close the ball is to your racket; this causes huge spatial distance issues and there will be many occasions where you unfairly miss the intended target. It's almost as if the developers knew this, which is likely why they provided so many spare lives. With repeated play you can become slightly more accustomed to the game's speed though (especially as the ball doesn't vary its momentum like in Breakout) allowing you to time racket hits with greater consistency. The most impressive aspect is the ball physics, as they're incredibly accurate and once you're familiar with how to direct shots to a particular part of the wall you'll start having a lot more fun. 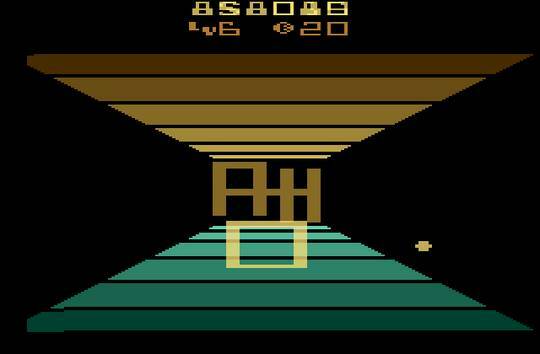 Also, the sense of depth created by the 3D effect is sensational for a 1983 game. The end of each set features an Eliminator game variation with five lives, a smaller racket, as well as jumping bricks; everything moves at a ridiculously fast rate and the reduced hit radius and lack of lives usually result in a quick and frustrating Game Over. Even if you do survive, the repetitive gameplay starts to wear out its welcome as you continue. Wall Ball is definitely worth a play-through and it does an admirable job of updating the classic Breakout formula into a 3D world. However, there's no denying its shortcomings in the gameplay department (namely its lack of ball shadows) that hold it back from being anything other than a neat curiosity. Random trivia: Avalon Hill released four other Atari 2600 games in 1983 called Death Trap, London Blitz, Out of Control, and Shuttle Orbiter.